Where do high earners pay the most tax? Last week, news reports said the Swedish government will hike its already high top marginal tax rate of 57 per cent to 60 per cent - making it the world's highest by beating out the 58.95 per cent charged in the Dutch Caribbean island of Aruba. Sweden's top marginal tax rate will apply to Swedes earning more than 52,500 Swedish krona (S$8,950) a month, compared with an income of £12,000 (S$26,000) a month needed for Britain's 45 per cent top rate to apply. A marginal tax rate is the percentage of tax applied to a person's income for each tax bracket in which they qualify. This method of taxation aims to fairly tax individuals based upon their earnings, so the more a person earns, the higher the tax rate. Critics say higher top taxes will make Sweden a less attractive place to do business and act as a disincentive to work. But its government says tax revenue needs to rise because of record immigration, soaring sickness benefit costs and an ageing population. Singapore will also be taxing top tier income earners more. In this year's Budget, the Government announced that for those with a chargeable income above S$320,000, the marginal tax rate for the additional income will be raised to 22 per cent from the current 20 per cent, starting with income earned in 2016. 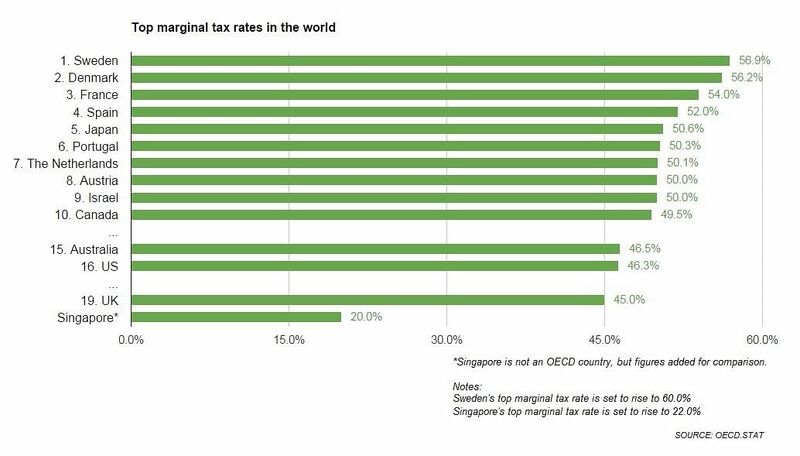 But Singapore's 22 per cent top tax rate is nowhere near the highest in the world. Comparing taxes around the world is difficult because tax laws in most countries are extremely complex and the tax burden falls differently on different groups in each country. For simplicity's sake, here is a ranking of the top marginal tax rates among countries of the the Organisation for Economic Cooperation and Development (OECD). The tax rates displayed do not take into account deductions, exemptions, or rebates.